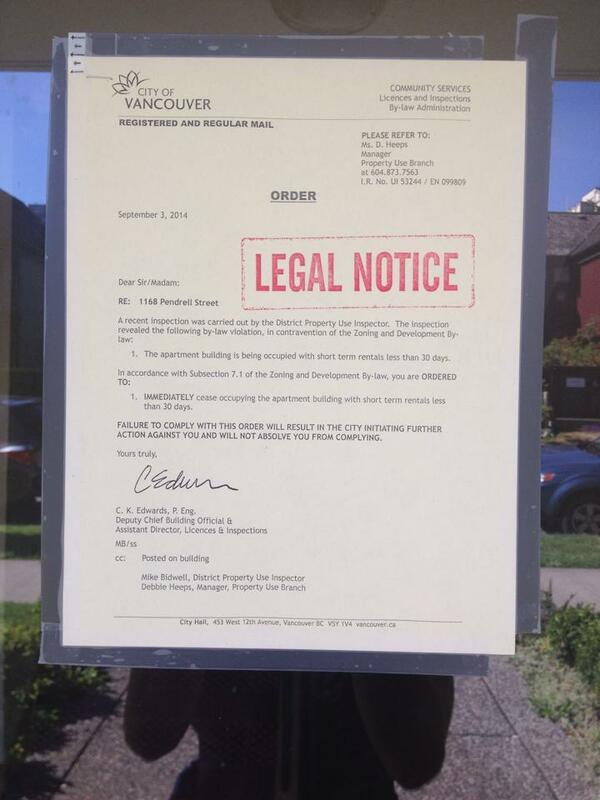 The landlord issued a signed written statement on September 12 that it was never his “intention to convert 1168 Pendrell into ‘a kind of Air BnB mini-hotel’.” Mr. Majithia, you could have fooled the tenants when you advertised the 2-Bedroom Penthouse @1168Pendrell on AirBnB that it sleeps 8 and put two queen size beds in each of the bedrooms. When the tenants wrote to the landlord about his AirBnB guests (strangers) the landlord he wrote back stating they were “tenants.” Does an overnight AirBnB guest sound like a “tenancy?” It sounds more like the landlord was running the Motel 8. Did the landlord require his AirBnB “tenants” to obtain tenant insurance for their one-night stays? Mr. Majithia, it’s very easy to make these kinds of statements after the City of Vancouver has already ordered you to STOP. The landlord seems to be very concerned about insurance. Does anyone know what kind of building or business insurance was required to operate @1168Pendrell as a bed and breakfast/hostel/hotel through the month of August? If the landlord issued a statement that he “does not condone illegal business practices” and conducts his business “practices in full accordance with the Real Estate Services Act of BC and the BC Residential Tenancy Act” then why has the landlord taken down all of his short-term daily, weekly, and monthly condo rentals off the landlord’s website? Is it that the landlord does not stand behind his brand? Tell us what you think: do you think the landlord is conducting his business practices in full accordance with legislation?